Geographically located in the heart of the tip of the Hague, is our common an administrative point of view, well integrated within the one hand the canton of Beaumont Hague, secondly of the Hague community of communes. Without jealousy or desires but without lies or truths against the town of Ste Croix Hague does not have the same natural wonders that its illustrious neighbors of the coast. However, if not beautiful, it is not so pretty. As rural by excellence, it is a haven in which to wander its paths either on foot, by bike, motorcycle or horse. Ideally located in the heart of the tip of the Hague, it allows after a short trip to join a nearby beach to suit your mood or those of the wind. Its midway position between the industrial center of The Hague and the urban area of the city of Cherbourg Octeville, proximity to natural sites or neighboring tourist areas are a very important advantage. You are close to everything but in benefiting from a distance that puts you away for the inconvenience associated with major industrial or urban areas. Beyond this introduction you will find below briefly presented the key elements that characterize our town in terms of demography, geography and history. Sainte Croix-Hague parish name is a fairly widespread and common, over 20 to date. The decisive - Hague correspond to the geographic site appears 1264 and soon became official in 1801. Population density : 84 inhabitants / km². Lucas : the Coastal river with its source in the hamlet Lucas and fell in Equeurdreville Hainneville in the harbor of Cherbourg after a course of 8 km in the communes of Ste Croix Hague, Tonneville Querqueville and Equeurdreville Hainneville. Biale : the Coastal River with its source in the locality near the Delle Trough Gast, the river serves as a natural border between Ste Croix Hague and the municipality of Branville Hague. It flows into the English Channel in the town of Urville Nacqueville after traveling 6.5 km on common Ste Croix Hague, Branville Hague and Urville Nacqueville. Laundrette lower town : Only the common laundry having withstood the ravages of time, it was long the place of rendezvous washerwomen with a lot of gossip. Still active today, we can see it from time to time washerwomen continuing the traditions for their strictly personal use. Sainte Croix-Hague was the capital of the canton of 1790-1801. Sainte Croix-Hague Church (XVIII) choir and nave (XVIII) - Bell bulb (1734) - Epitaphs (XVI and XVII) on families Moncel and Ozouville - Saint Nicolas statue (XVII) - canopy (twentieth) Barillet . Cross Cemetery (XV) rebuilt in 1636 and moved in 2003 - called Way of the Cross Croix Vautier (XVI). Bacchus was the gathering place for cattle to be taken to the Couville station. 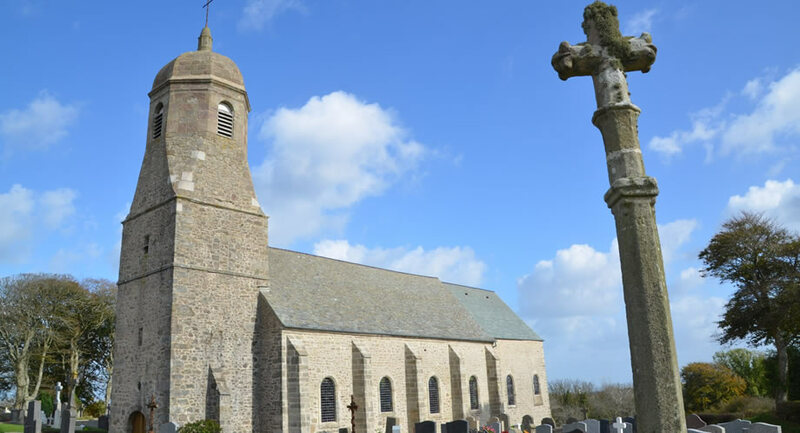 The Ozouville street is named for a younger branch of the family of O (u) zeville near Montebourg one of the oldest Norman families, present alongside William the Conqueror. Sainte Croix-Hague was throughout the occupation in the prohibited area is released June 28, 1944 by the 60th Regiment of the 9th US Division.